It’s thought that a motte-and-bailey defensive structure was first built on a mound on a little island in a swamp in 1100 AD. A hundred years later, this wooden tower was replaced by a round tower made of tuff, remains of which can still be seen today. Over the centuries the castle was added to—a first floor was built as well as a circular wall—until it suffered serious damage at the beginning of the Eighty Years’ War. Renovations began in 1600, laying the framework of today’s structure. A fire destroyed the main castle in 1735, but again renovation work began almost immediately. The various members of the aristocracy no longer would live here, though, and the property served a number of purposes, such as a seminary, for example. Like the story of many of Europe’s grand castles, by the early 20th century, the castle fell into a state of dilapidation. The owner, Count Hohenzollern-Sigmarigen sold the property to textile magnate Jan Herman van Heek in 1912, who began to renovate. A fire in 1939 destroyed much of the work, but he started on it once again, rebuilding the original circular wall and changing the roof to a number of individual smaller ones. 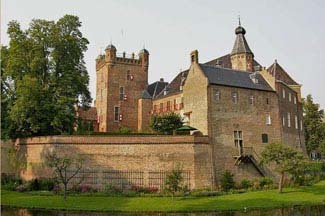 Some of the personalities who owned the castle over the centuries were Willem IV, Herman van den Bergh, Graaf Oswald III, and Johan Baptist van den Bergh en Hohenzollern. Huis Bergh is also open to the public (tickets may be bought at the Grand Café Heeren Dubbel located at the outer bailey). You may explore the castle and the art collection at your leisure, or take a guided tour at a set time. The private art collection includes early Italian and Northern European paintings, historical portraits, medieval manuscripts, and sculpture. ’s -Heerenberg is right on the Dutch-German border, about 5 km north of the German town of Emmerich. From the A12 Arnhem-Oberhausen highway, take Exit 30 in the direction of ’s-Heerenberg. Nearby: bicycling; hiking; golf; Arnhem; World War II sites; Zeddam (which has the only remaining working medieval tower mill in the Netherlands). Yes, including the ceremony. Inquire hotel for details. Huis Bergh is one of the finest castles in the Netherlands. It operates primarily as a museum with a grand art collection. Stunning woodlands and gardens are open to the public, as well. Some of the oak trees you see are over 200 years old. Fantastically, there are two suites located in the “flat” tower and the round tower on outer bailey that offer accommodations! Both suites take up two floors. Bedrooms are spacious and tastefully decorated, with a spiral staircase leading up to the living area, where you’ll find a comfy sofa and arm chairs. There’s also a kitchenette and dining area. Walls are massive, with alcoves cut into them. Each tower boasts a sun patio where you have views of the castle, woodlands, and garden. Bathrooms are fully modernized. Each suite accommodates two people only. No extra beds can be brought in. If stairs give you a challenge, these rooms may not be suitable. To give that extra medieval touch (if you’re in the round tower), a small drawbridge goes up beside your tower at night and comes back down in the morning. Breakfast can be brought to your tower, and for lunch or high tea, the Grand Café Heeren Dubbel offers an international kitchen. There are dining options in the nearby village. Kasteel Huis Bergh is a gorgeous, romantic place that any castle lover will fall for.